I found the following image floating around the Internet yesterday, and I had to shake my head in disapproval. 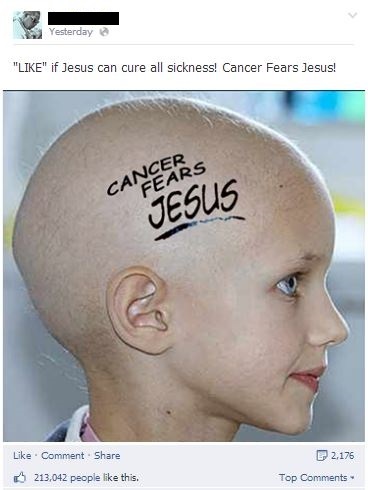 Cancer doesn’t fear Jesus. Cancer doesn’t have a central nervous system capable of forming any emotions, not even fear of 2,000-year-old zombie gods. Furthermore, the image shows a patient who obviously put trust in medical professionals who prescribed chemotherapy or radiation (it’s unlikely her hair loss was caused by intercessory prayer). Why wouldn’t the author of this image use a healthy looking person to get their point across? This image is rather harmless and innocent, but it’s incredibly annoying. If you believe praying to Jesus can help cure cancer or other ailments (by the way, the opposite is true) then that’s the way you feel, but don’t get your hopes up. So far Jesus has contributed precisely nothing to the medical field. Don’t share this image to inspire people. Mock it. This entry was posted in Atheism and tagged Atheism, Cancer, Christianity, God, Jesus, medicine, Religion. Bookmark the permalink. I was thinking that maybe an atheist created this pic to discredit. But then I remember talking to a Baptist lady who said she didn’t like Catholics because they drank alcohol. I reminded her that Jesus’ first miracle was turning water into wine so the party could continue.